Vietnam’s great potential in IT and wide-scale smartphone coverage will be the keys for the country to develop its digital economy and seize great opportunities in Industry 4.0. Nguyen Dat reports. The main hall of the InterContinental Hanoi Westlake was packed with several hundreds of people last Tuesday, who arrived as representatives of international organisations, embassies, and the media, as well as experts, to attend the “ASEAN 4.0: Entrepreneurship in the Fourth Industrial Revolution” conference held by the Ministry of Foreign Affairs. 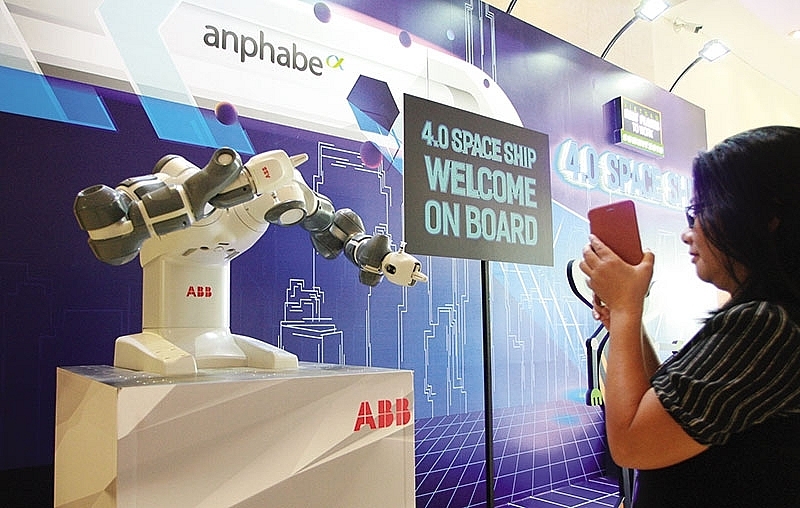 The event was focused on how Vietnam can develop its digital economy in the context of Industry 4.0, stressing the need for Vietnam and other ASEAN nations to take advantage of their IT potential to capitalise on opportunities offered by Industry 4.0. This conference was also the first in a series of events to be held ahead of the hallmark conference “ASEAN 4.0: Entrepreneurship and the Fourth Industrial Revolution” in Hanoi during September 11-13, 2018. At the conference last Tuesday, Indonesian Ambassador to Vietnam Ibnu Hadi made an impression by talking about the way Indonesia welcomes Industry 4.0, a set of highly disruptive technologies including artificial intelligence, robotics, blockchain, and 3D printing that are transforming social, economic, and political systems and putting pressure on leaders and policy-makers to respond. The Indonesian government has selected five key sectors for the initial adoption of Industry 4.0, including food and beverage, textile and clothing, automotive, chemicals, and electronics. “These sectors would need a very high level of digitalisation in the future, and they are the biggest contributors to the Indonesian economy,” the ambassador said. Currently, Indonesia is more or less in the same category as the five largest regional economies – Malaysia, Thailand, the Philippines, and Vietnam. Singapore is the most advanced. “The difference is Indonesia is the largest economy, so the potential is relatively larger. That is why we have a larger number of the biggest unicorn startup companies,” Hadi noted. According to the Ministry of Information and Communications, as of late June 2018, Vietnam had about 136 million mobile phone subscribers – including 2G, 3G, and 4G services. Some 54.2 per cent of the country’s population use the internet. Notably, Viettel is planning to pilot its 5G service next year, which will be officially launched by 2020. Vietnam ranked 89th globally in e-government development in 2016, and this rank can improve if the Vietnamese government manages to tap into the potential of internet usage. The Vietnam Provincial Governance and Public Administration Performance Index conducted over more than 14,100 Vietnamese people late last year showed that 37.97 per cent of respondents have internet in their homes, up from 31.34 per cent in 2016. Nearly 92 per cent use the internet for up to five hours a day. Some 84.2 per cent read information on smartphones and personal computers, with nearly 58 per cent using smartphones. “Vietnam is striving for sustainable growth by improving the quality of growth and taking advantage of the opportunities of the Fourth Industrial Revolution to increase labour productivity and competitiveness and move higher up in the global value chain,” Deputy Minister of Foreign Affairs Bui Thanh Son told the conference. According to Tran Dinh Thien, former director of the Vietnam Economics Research Institute, these are great foundations for Vietnam to build a digital economy. “Vietnam has many opportunities in Industry 4.0. However, the problem now is applying the lessons from the region, such as Indonesia and Singapore, to Vietnam and integrating data among ministries, agencies, sectors, and individuals into one integrated and shared system,” Thien said. According to Dennis Brunetti, president of EuroCham Vietnam, which represents over 1,000 European firms in the country, to fully reach its potential, Vietnam needs to invest more heavily into education and training. Nguyen Trong Nghia, deputy CEO of state-owned VNPT-IT, noted that the government is now beginning to develop policies related to digitalisation, and VNPT is supporting the government on this path. “We have signed 20 deals with cities and provinces nationwide to develop smart cities,” Nghia said. “By 2020, we will have to recruit about 5,000 IT engineers, but this will be difficult as there is already a shortage of them,” Nghia said. Meanwhile, Ambasador Hadi underlined that Indonesia spent a great deal of money on human resources training to meet the requirements of Industry 4.0. With improvements in education and training services, the Indonesian e-commerce market has been strongly developing in many sectors, such as fashion and beauty ($2.47 billion), electronics and physical media ($1.27 billion), travel-accommodation ($2.42 billion), furniture and appliances ($1.29 billion), and toys and hobbies ($1.44 billion). The conference “ASEAN 4.0: Entrepreneurship and the Fourth Industrial Revolution” is scheduled to be held during September 11-13 in Hanoi by the Vietnamese government and the World Economic Forum. This event will draw the participation of government leaders, international organisations, specialists and top business leaders from ASEAN and other regions. There will be 55 meetings and sessions during the event, which will discuss ASEAN’s integration into the global economy, the search for new economic models, governance methods and business models for ASEAN enterprises and governments in the context of the Industry 4.0, and development of smart infrastructure, startups and innovation.